These two projects are one year apart and I can now see how differently I felt about this design a year ago. :) This year I was thinking about sun glitter, warmth and sweet smells in the air - meet Honey Weather, a wider version of the blue scarf. 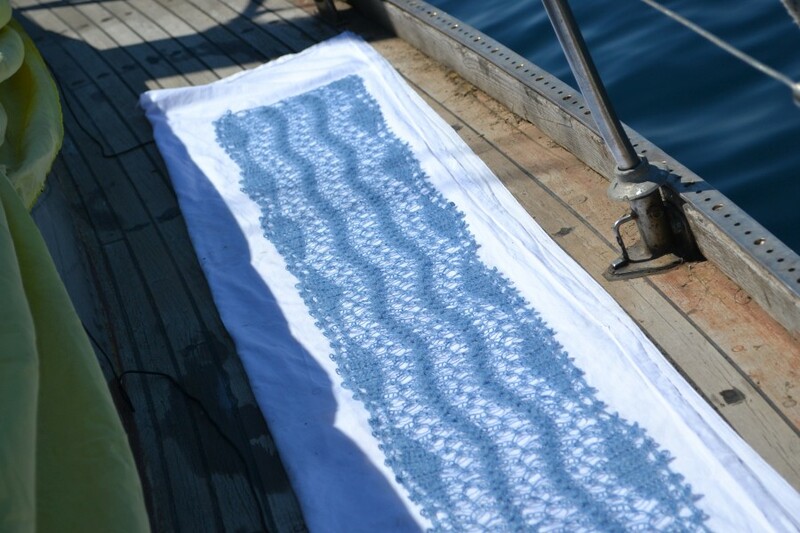 The beautiful bubbles in the stitch pattern are Lover's knots, combined with standard crochet stitches. Not a complicated stitch at all as you can see here: How to crochet Lover's knot. This scarf is very easy to crochet and, as such, is a perfect travel project. If you are experienced in crocheting Lover's knots, the wider version of this scarf will take you less than 10 hours (I spent 6 hours in total). Even the finishing stage is exciting, as the edge and blocking work wonders with this design. The one-row edging gives it a perfect "wow-effect" finish, and the inner lines become wavy as soon as the longest sides of the scarf are blocked straight. Alternatively, you can straighten the inner lines and let the border remain wavy instead.